We are very excited to announce the establishment of our PKC Legacy Series Open Events for the 2019 Season. Back in the 1970’s when Jarvis Umphers first began PCA, the foundation was built solid upon the cornerstone of beating the dogs in your cast and advancing. This simple principle was a breath of fresh air to all fair minded hunters who had long desired a level playing field of competition, without concern as to the quality of their guide, or the scores of the other casts, neither of which they had any control over. The PKC Legacy Series Open Events are not only a step back in time, rekindling the competitive flame of our mature members, but also a stepping stone toward fresh opportunities for those newer hunters who have only experienced the standard Open Events, thus far. If you and your dog prefer the elimination type events, this is exactly what you have been looking for! 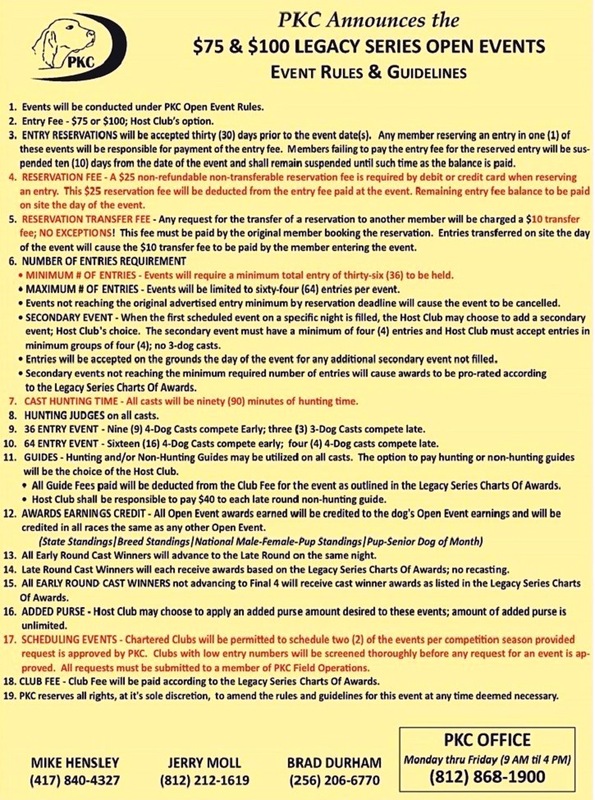 Since the "Trial Run" at Junction, Illinois this summer, we have made a few updates, and soon we will be accepting club requests for the new PKC Legacy Series Open Events. Clubs will now have the option of a $75 or a $100 event, and the minimum entry requirement has been lowered to thirty-six. Qualified clubs will be permitted two Legacy Series Events within the 2019 Competition Season. Legacy Series Events may be no closer than 300 miles on the same night. Clubs will be screened based upon their average number of entries and available guides. Not every club will be approved to hold these events. Before submitting a request, please read over these details carefully. When a club fills their first event to 64-Dogs, they will have the option to add a second one. If the second hunt does not fill by reservations, entries may be taken for it on the grounds until it is full. If the second hunt does not fill on the hunt night, awards will be prorated based upon the Chart of Awards shown below. MINIMUM/MAXIMUM # OF ENTRIES ‐ Event will require a minimum of thirty‐six (36) entries. Events not reaching the original advertised entry minimum by reservation deadline will cause the event to be cancelled. Club will have the option to increase entries above thirty‐six (36), up to a maximum of sixty‐four (64) at its’ discretion, provided guides are available.